Referencing the Teaser Trailer for Thor Ragnarok! Please watch it here first if you haven't already! I had the idea for this before the newest trailer was shown at Comic Con. >: Best viewed not in full screen because sprites are very small. To Jerbear for ideas, motivation and having a better computer than me for running After Effects. 8-10-2017 Maintenance is over, right? Did anyone already get their In-Game Title? I just checked mine and it's still missing. Edited by ROCKheir, 10 August 2017 - 02:42 PM. I hope the delay is due to CMAstra being a little forgetful about her timetable and not due to the Custom In-Game Title being actually impossible/unimplementable for some reason. Might be because the victors have conflicting views of what the title should be, which means no conclusion yet. How about giving [RO's Most Talented] to the winners who want it and [Ragnarok's Most Talented] to the ones who favor it? xD Surely it's doable. The question is if folks will not make a big fuss out of the two versions of the winners' title. ^^^^^this is a good idea. RO's Most Talented for me please. The OTHER one is wayyyyyyyy too long. RO's Most Talented is almost too long but I don't see any way of abbreviating it further without losing recognizibilty. So, for the sake of brevity we'll go with [RO's Most Talented]. Secondly, we were not able to implement it during yesterday's maintenance due to Campitor and team attending to other fixes. We'll be applying it next maintenance - unfortunately can't do any sooner, since it does require a reset to implement. So sorry! The good thing is, once you have it, it is yours forever and ever!! Thanks Astra! Have a good weekend. Can we just have a survey among all winners which of the two titles is most voted for? So far there's 3 out of 5 responses that want [Ragnarok's Most Talented] whereas only 2 is for [RO's Most Talented]. Really now, 2 maintenance passed, still no in-game Title reward. How many maintenance does it need to be finally implemented? It should be in! Everybody please check your characters that you specified to have the Titles on, they should be in there, Campitor showed me that he tested them and inserted them into your characters. If it's missing, let me know. We flagged the winners as having gotten the achievement but you'll still need to claim the title. Got it now. Thank you, CMs. 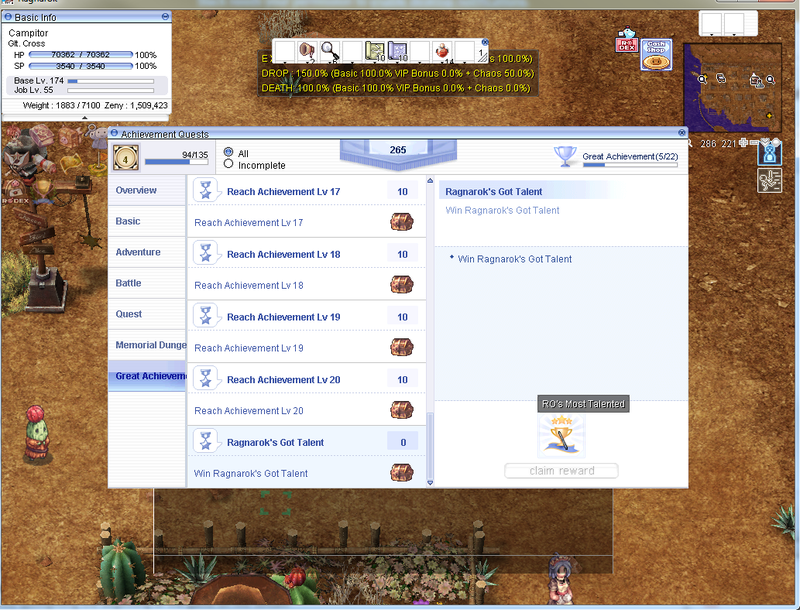 I looked through the achievement tab earlier but didn't notice the "Ragnarok's Got Talent" as I was expecting it to be at the bottom of one of the tabs. Mine turned out to be somewhere near the middle. Got mine too. Thank you very much. Why does mine say "RO's Most Luscious" ?? I cant find the achievement on my achievement list. I checked all tabs. Are you sure you put it on my char named Luke Star? now can i sent a video to get prize ?